Film star Cheadle and human-rights activist Prendergast pool their talents in an earnest attempt to arouse public concern over the genocide in Darfur and channel that concern into productive action. The authors speak in separate voices about the personal journeys that brought them to this task. Cheadle is more formal and reserved as he describes his work on Hotel Rwanda and how that film led him to the struggle against genocide in Darfur. 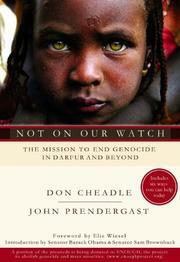 Prendergast writes with breezy assurance as he traces his activism back to a 1983 trip to Mali that revealed to him “the unfairness of the relationship between Africa and the rest of the world.” Their voices are joined, however, in the book’s main narrative, which shows what is happening in Darfur and seeks to create a popular constituency that will bring pressure on the U.S. government to take action. They sketch the historical background of Darfur’s present crisis: competition for land and access to water, the Sudanese government’s manipulation of local tensions for political gain. They present a graphic picture of the atrocities taking place there and the devastating effects of the well-organized Janjaweed raids on non-Arab villages. Examining previous efforts on behalf of victims of human-rights violations, they conclude that pressure from citizen groups is the most effective way to shame governments into action. To this end, they call on readers to take six steps: raise awareness, raise funds, write a letter, call for divestment, join an organization and lobby the government. They provide specific examples of how each of these strategies has worked in other situations. An appendix and boxed inserts throughout the text summarize courses of action, offer concrete advice and direct readers to additional sources of information, making this work a virtual handbook for aspiring activists.